On 1st and 2nd August, I had my first work day out of office and attended a community visit with the Pravah Adolescence Intervention (AI) team. Beforehand, I had decided to take a break from studying Cultural Sciences in Europe, to fly all the way from Germany to India and to take part in Pravah’s work. It has been more than a month working in the Pravah office. Now, I got my first opportunity to meet with our target group and the reason of Pravah’s existence- the young people out there – also, the main motive for me to get involved. Pravah wants to inspire youth leadership… But how can young people take responsibility for society if they don’t know the realities their city and country is facing? That’s why the AI team invited children from different backgrounds to a journey to unexplored areas. On one side, we took the “elite”’ children from Sanskriti School on a learning journey outside the bubble, to Aman Biradari, an organization which supports street children by offering education, food, health and protection. And the children from Aman Biradari, on the other side, got an insight into the seemingly consistent and well designed life of the Sanskriti students. We tried to always keep in mind our one main objective: an encounter at eye level. On day one, the children from Aman Birandari got acquainted with the daily environment of the Sanskriti kids, their school, which is an impressive space: it’s a huge, well equipped school including a jazz room, a swimming pool, several sports grounds, dancing and theater spaces. Firstly, the Aman Birandari group got welcomed by the Sanskriti children and got introduced to the class which was followed by some ice breaker games. The highlight of the day was the guided tour by the Sanskriti students showing their visitors around which enabled them to get to know each other in a casual way. 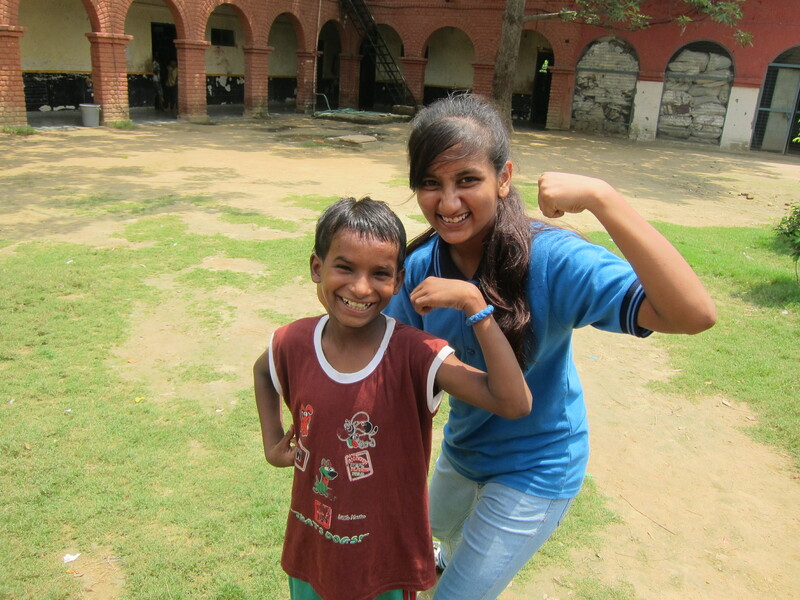 The “magic”, however, happened on the second day when we took the Sanskriti students to Aman Biradari. We divided the groups into couples, each consisting of one Aman Birandari child and one Sanskriti child. 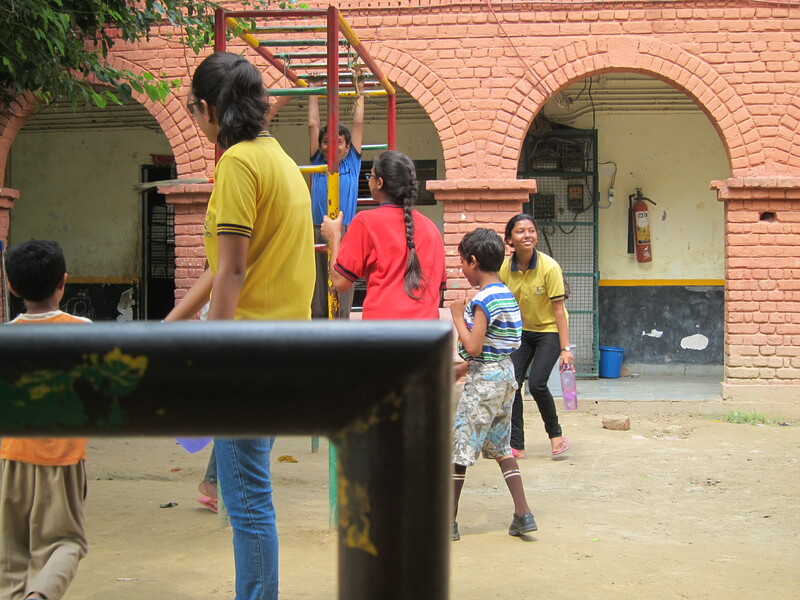 We gave them the task to show the Sanskriti kids around and encouraged questions about each other’s ambition, favorite food and favorite game. I was amazed and surprised how quickly the youngsters started walking around together, talking to each other and getting to know each other on a personal level. Suddenly there were lots of sparkling eyes, smiles and laughter. The space was, maybe a not so perfectly designed one but a very adventurous space where children could climb up the roof, walk around and interact freely and cheerfully. Additionally, their mutual fascination came across in the aftermath, when everyone wanted to share his partner’s story. Honestly speaking, everything was in Hindi and I couldn’t understand.. but when they expressed their ambitions in English I was captivated by their wishes to become dancers, or engineers or the next Steve Jobs! At the end of our visit we got the honor to see some cool dance performances and a little boy standing in front of everybody and singing for us with his tender and beautiful voice. All in all, it was a fun and insightful journey. This experience showed me the kind of schools which are nowadays set up in India, those huge private schools. I could only guess how much effort, money and time must have gone into the creation of such a beautiful space. On the visit to Aman Biradari, I was impressed how well the children got along instantly. Those tiny children showed around their visitors and explained to them everything, like grown-ups. And in the end, several of them were as courageous to perform in front of the whole group! I had the impression that it had offered the children an encounter on eye level and had affected a broadening of the children’s, educators’ and facilitators’ mind. I wish i could experience it first hand. Blog seems to tell a story which has come out straight from the heart. I sincerely wish Pravah achieve their mission and subsequently their vision and we get an inspired youth to take the nation forward…Keep going!! A very well written blog, straight out of the heart !!! Makes one feel as if they were there with you with the kids at the school !! !